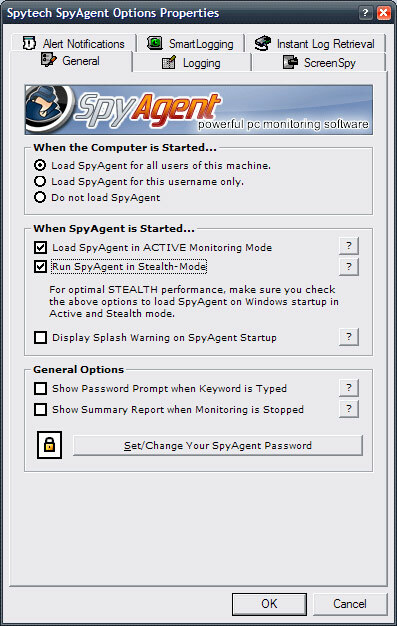 Use the guide below to install Spy Agent on your computer in 10 easy to follow steps. If you have any questions along the way do not hesitate to contact our staff and we will be glad to assist you. Before installing, please take the preparatory steps listed in Spy Agent's Help Documentation installation instructions. After downloading the Spy Agent install file navigate to where you downloaded (in this example the Windows desktop). Double click on the Spy Agent install file to begin installation on the computer. Click through the installer until you come to the screen shown below. 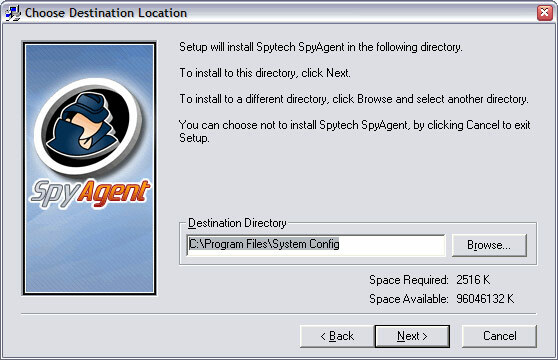 This is where you will choose the folder location for the installation of Spy Agent. We recommend you change this from the default (c:\program files\spytech software...) to the path listed below or one of your choosing. Make sure to remember this path to access the software. Once you have configured the Destination Directory you can click 'next' button to continue. Click through the installer until you come to the screen shown below. This where you choose the install type for Spy Agent. If you do not wish for Spy Agent to show in the Windows Start Menu then choose 'Stealth Installation' and hit the 'next' button to continue. You are now asked if you wish to include an uninstaller - for total stealth installation 'No' as shown below. 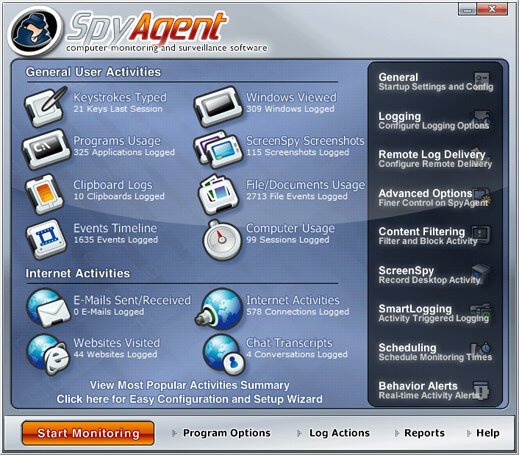 After installation has completed you will now configure and run Spy Agent. Go to the Start button on your desktop and click it once to bring up Start menu. Select the 'Run' option to show the window below. 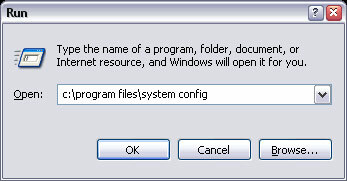 Enter your installation path in the window (this is the same path you entered in step 2) and press the 'OK' button to continue. 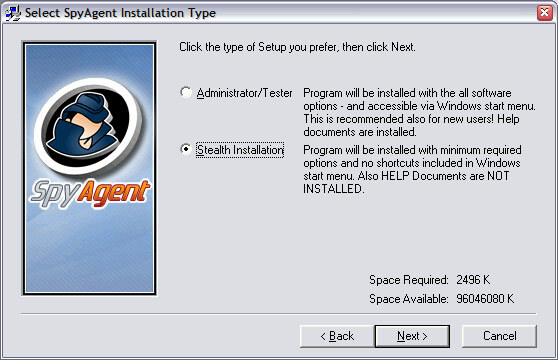 You are now in the installation directory for Spy Agent and will see the files below if you selected the stealth installation. Now, highlight the sysdiag.exe file as shown below. Right click on the sysdiag.exe file with your mouse and select 'Rename' from the menu by clicking it. 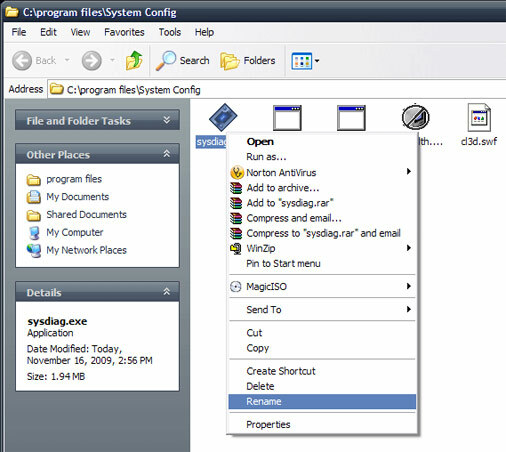 You will now be able to change the name of the sysdiag.exe file. In the example below we have decided to rename it "snmp.exe" - you can use this name or any name of your choosing to conceal Spy Agent's identity on the computer. 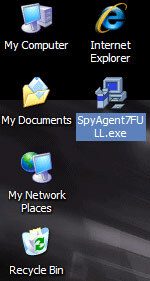 After renaming the file above you can now double click on the newly rename file to run Spy Agent. You will be prompted to configure your password - please do so and remember this password. Once inside Spy Agent click on the 'General' button on the right side of the Spy Agent window. The window below will now show - enable the following options as shown in the picture below. After you configure the General options you can click the 'Logging' tab and configure the logging options as well! When you are done click the 'OK' button to save your options! Final step - now click the 'Start Monitoring' button that is highlighted below. You will be prompted for your password - enter it and click 'OK'. You will receive a notification message on how to bring Spy Agent out of stealth mode later view logs - read this message carefully! Spy Agent is now running in total stealth and will run invisibly when you restart your computer as well. To stop stealth mode run the 'nostealth.exe' in the Spy Agent installation directory or press CONTROL+SHIFT+ALT+M on your keyboard to bring up the password window and access to Spy Agent's settings and logs.